In stock -This product will ship today if ordered within the next 6 hours and 47 minutes. Natures Aid GlucoSlim contains Glucomannan which contributes to the reduction of body weight. The beneficial effect is obtained with a daily intake of 3g of glucomannan in the context of an energy restricted diet. Glucomannan (Konjac root), Vegetable Capsule Shell (Cellulose). Take 2 capsules, 30 minutes before each of your 3 daily meals, with 1-2 glasses of water. Choking hazard if not taken with water. Do not take if you have difficulty swallowing. 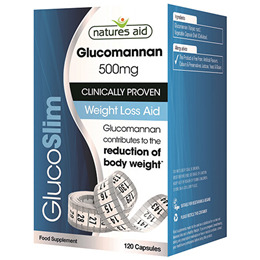 Below are reviews of Natures Aid GlucoSlim - Glucomannan - 120 Capsules by bodykind customers. If you have tried this product we'd love to hear what you think so please leave a review. I have used it for about a week now and it appears to improve the condition of constipation. Need more time to make sure.